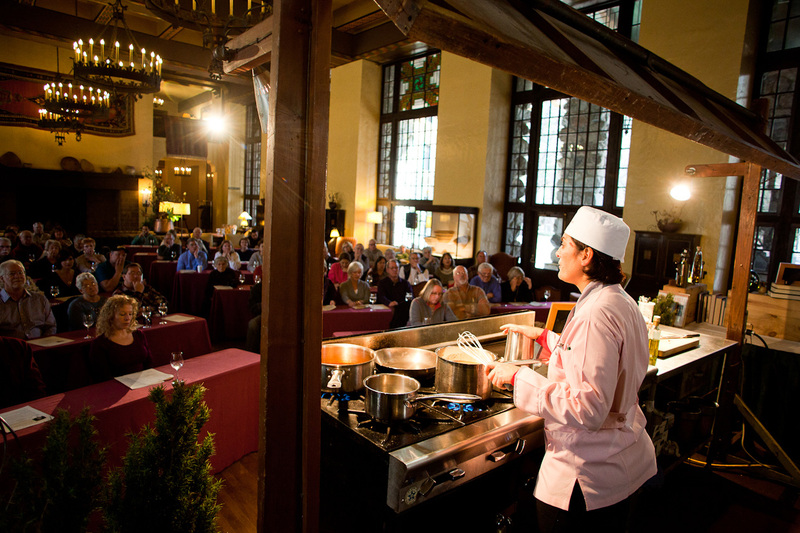 Each fall, wine enthusiasts gather in Yosemite for Vintners’ Holidays at The Ahwahnee and enjoy educational wine tasting seminars and a chance to meet some of California’s most esteemed vintners. 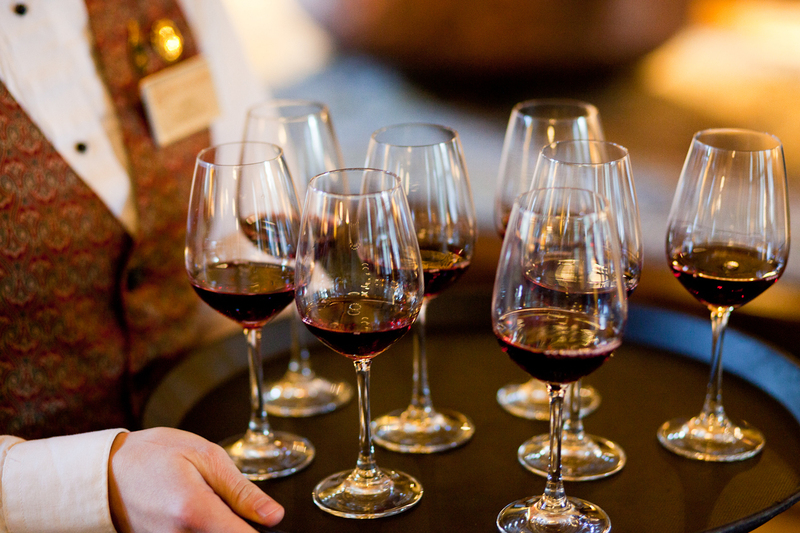 Part of the event includes a five-course gala dinner that highlights the wines of the featured vintners. Since the wines are the star, The Ahwahnee’s executive chef, Percy Whatley, crafts the menu around the wines being poured — not the other way around. Read on to learn more about Percy and how he goes about developing the delicious Vintners’ Holidays menu. Q: How long have you been creating the menu for the Vintner’s Holidays Gala Dinner? A: Since I was given the opportunity to lead the kitchen in 2005. Q: For the Vintners’ Holidays Gala Dinner, you are creating the menu based on the wines that will be served. How does this work? A: With Vintner’s Holidays, the winemakers give us information about the wine that they plan to pour for the gala meal and we solicit any feedback that they may have regarding what types of food and flavors pair well with the wines. I take that information and create the particular dish for that wine with their expert feedback. Usually the information is specific with regard to a particular ingredient, such as Lobster with a Sauvignon Blanc. This gives me the ability to put some of my personal finesse into the garnishes and other flavor profiles to enhance the wine and food experience. It really is a lot of fun. Q: What are you looking for when pairing food and wine? A: There are subtleties in wines that need to be found and engaged with when writing the menus for these dinners. Many of these subtleties are typical of the various wines being poured. Some may be a little more acidic than typical, or tannic, or more “oaky,” or more malo-lactic (buttery). Some wines are blended and are not typical at all. But overall, I am looking for the right degree of lightness or richness to a dish compared to the wine being poured. The garnishes in the dish should complement the center of the plate as well, which in turn will complement the wine and the layers of flavors within the wine’s body. Q: What are a few of your favorite wine and food pairings? A: Lamb with Zinfandel, scallops with Pinot Gris, pork belly with Pinot Noir, light buttery pasta dish with Chardonnay. There are a number of other international wines that I like a lot, Albariño, Barolo, Lambrusco, Valpolicella, Vinho Verde, and Malbec to name a few. Q: Do you think wine is better served with food? Why? A: Red wines definitely need food, otherwise your palate is tired after one glass. White wines aren’t as tannic and can be enjoyed without food, but food helps your palate process the sensory overload that happens when you drink wine. Whether it is a canapé of pate with your glass of Merlot, or a caviar blini with your sparkling brut, those little bites of food create an entirely different experience on your palate vs. just drinking the wine. Q: Can you share a few tips on pairing wine? A: Keep your food simply prepared without overcomplicating the preparation of it. If it is a steak, then simple salt and pepper seasoning, seared or grilled to your desired temperature, and rested well. Enjoy it with wine that is the right temperature, not too cold, not too warm. Let the wine sit in your mouth for a few seconds before swallowing it so you can really get the subtle flavors of the wine. Do this before your first bite of food, then take a bite and repeat. How was that second sip of wine? What is most important is to drink wine that you like because if you like it, it is a good wine. Then have food that you like with it. Generally this is what makes a good pairing, especially if you enjoy it with family and friends — that is the true joy of good wine and food! To taste Percy’s wine and food pairing yourself, join us for Vintners’ Holidays in Yosemite in November or December. 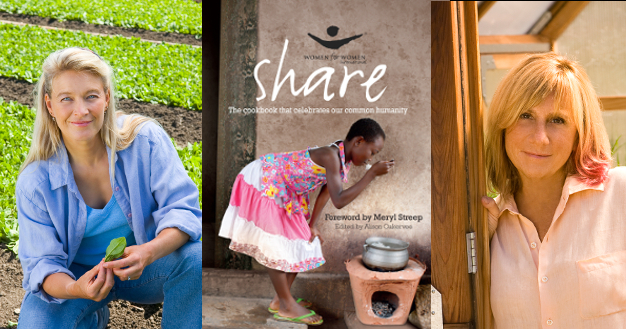 Elizabeth Falkner has been a longtime participant in Chefs’ Holidays and graces the cover of this year’s brochure. We caught up with her this summer to talk about Chefs’ Holidays, her culinary career, and her love for the park. Falkner worked in a handful of restaurants before opening her own San Francisco pastry shop and restaurant, Citizen Cake. For years she has been an innovative player in fine dining and culinary events across the country. Falkner said she loves culinary travel through food and meeting and working with new chefs. She now lives and works in New York, and after opening nine restaurants in San Francisco and New York City, she’s not attached to a restaurant at the moment. She said she enjoys the freedom this gives her to cook at food and wine events while working on a memoir and other projects. Over the years that she’s been featured in Chefs’ Holidays, Falkner said she has enjoyed meeting fans, friends and family of the other chefs, and repeat attendees to Chefs’ Holidays. But she said it’s especially fun seeing people experience Yosemite and Chefs’ Holidays for the first time. Having visited the park as a child and as an adult, Falkner is no stranger to Yosemite, but the park still carries a sense of awe for her when she visits for Chefs’ Holidays. Chefs’ Holidays sessions run between January 10 and February 4, 2016. Elizabeth Falkner is the headliner chef for Session 4 on January 20 and 21. Visit our website to learn more or book a package. 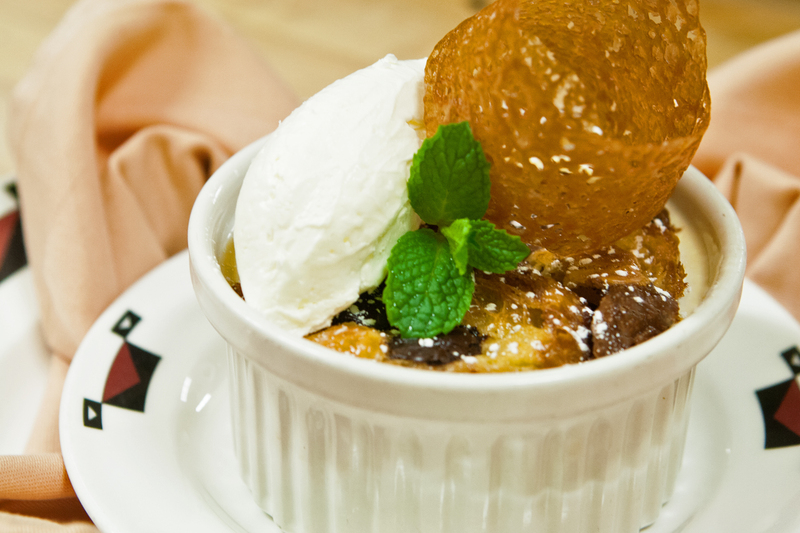 This dessert from Chef Paul Padua is one of the most popular on The Ahwahnee’s Dining Room menu. 7.Pour half of the hot custard mixture over the croissants to soak. 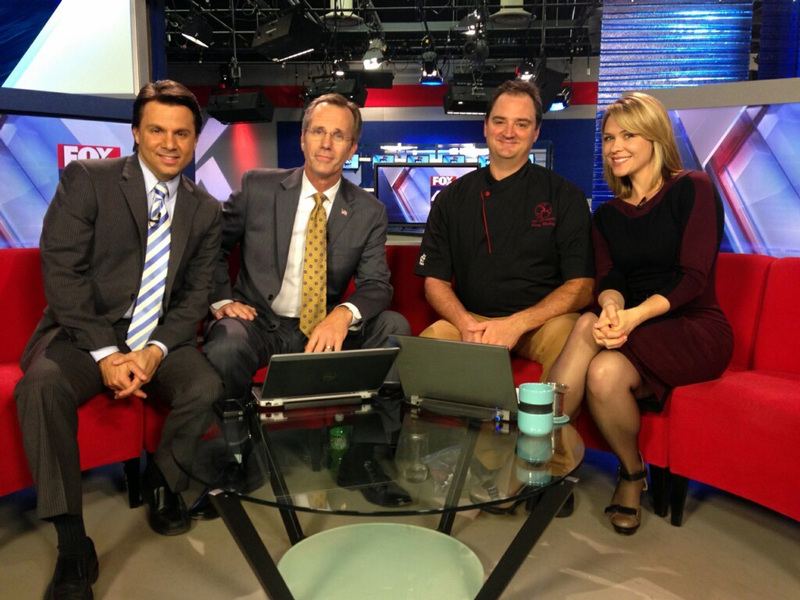 Executive Chef Percy Whatley shared the following recipe on Sacramento’s Fox 40 Morning Show on November 26, 2013. Chef’s Notes: Any Autumn squash can be used in this recipe, but keep in mind that there are different carbohydrate contents to different varieties of squashes. A Kobocha squash, for instance is much more starchy than Butternut, therefore it is always a good idea to have extra vegetable stock on hand to adjust the consistency when finishing the soup. 1. In an 6 Quart sauce pan, melt 2 Tblsp butter over medium heat. Sweat diced onions until translucent. Add cardamom and ginger and stir in to release aroma. 2. Add squash, potatoes, 6 cups of stock, and thyme leaves, bring to simmer for 30 minutes. 3. After squash and potatoes are very tender, remove from heat and add cream, season with salt and pepper to taste. 4. Blend until smooth adding the other 2 Tblsp butter. Adjust thickness/consistency with more stock if necessary. Readjust seasoning as necessary. 5. Serve with a dollup of sour cream and a sprinkle of fresh chives. 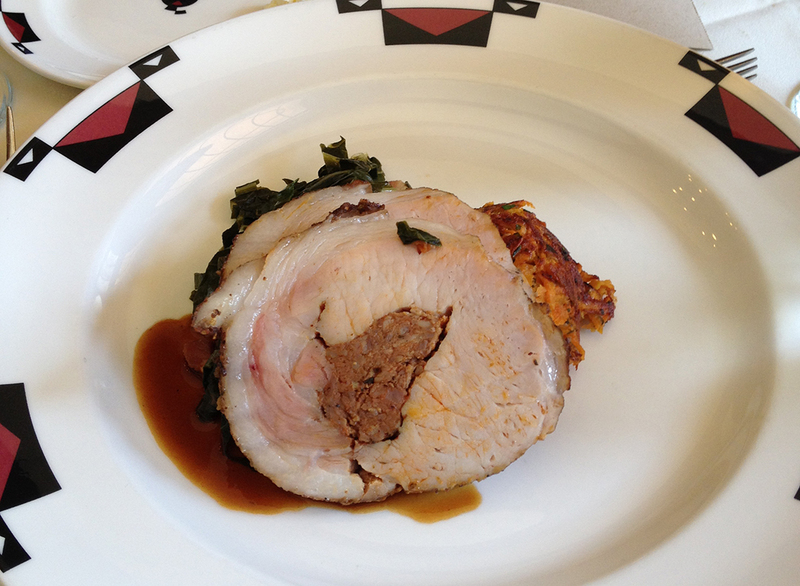 Chef Percy’s Roasted Pork Loin with Chorizo, Sweet Potatoes, Collards and Maple Tequila Glaze. Photo by Teri Marshall. With several years of study already under his belt, Chef Percy still must complete one final test in order to be certified at one of two campuses of the The Culinary Institute of America, either in New York or Napa Valley in 2014. In the meantime, you may be the beneficiary of Chef Percy’s ever-growing culinary knowledge during his Master Chef studies, as he oversees and prepares meals for the Signature Food & Wine Events in Yosemite that take place at The Ahwahnee every year: Vintners’ Holidays, Bracebridge Dinner and Chefs’ Holidays. During the fall, Vintners’ Holidays presents wine and the food it pairs with in a celebration that focuses on California winemaking. 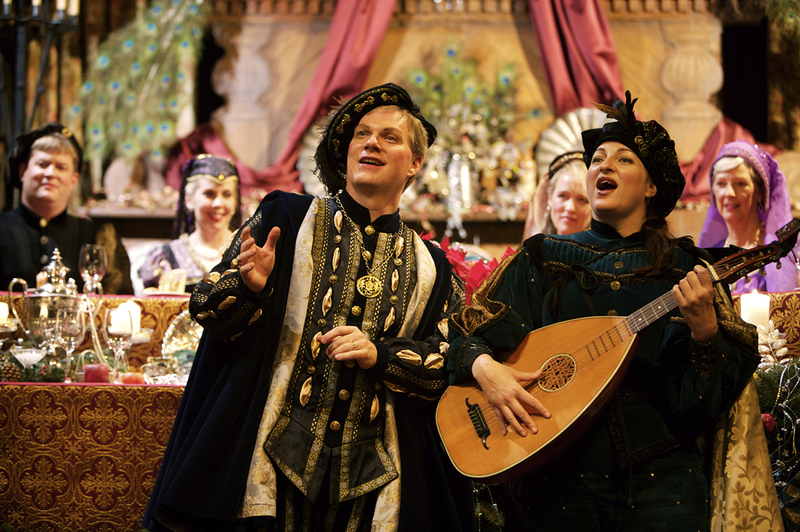 For the winter holidays, The Ahwahnee Dining Room is transformed into Bracebridge Hall of Merry Old England with a seven course feast and characters filled with song and good cheer. During the depths of winter, you can warm yourself at Chefs’ Holidays where the American culinary scene is showcased at cooking demonstrations and a gala dinner by visiting chefs. Packages including lodging, presentations and gala dinners are available for all three Signature Food & Wine Events. Wine tasting at Vintners’ Holidays. Photo by Chris Andre. Holiday serenade at the Bracebridge Dinner. Photo by Lani Spicer. Cooking demonstration for Chefs’ Holidays. Photo by Chris Andre. 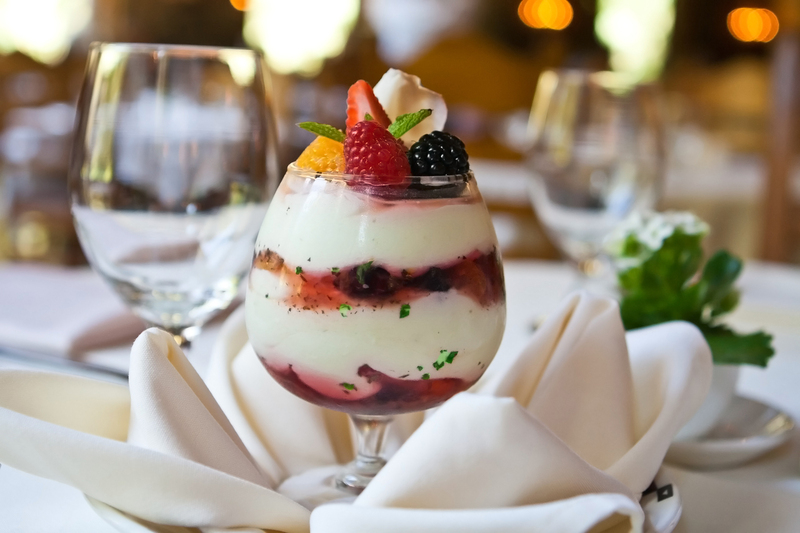 Though you can plan to attend an event in Yosemite that features Chef Percy’s culinary creations, you may also be lucky enough to be in the right place at the right time for an unexpected treat. This summer the Rotary Club of Yosemite shared a ‘practice’ California Luncheon prepared by Chef Percy that featured two choices: Summer Breeze menu featuring salmon and lobster vol-au-vent with watercress as well as local free-range roasted chicken and peach tart with huckleberry compote, or Plantation Supper menu featuring oxtail soup and roasted pork loin with chorizo and maple tequila glaze. The Master Chef certification test has no written component – it is simply a measure of the mastery of cooking skills and knowledge. For the Rotary Club luncheon, Chef Percy perused the stores of The Ahwahnee’s kitchen and created the menus that impressed club members with their spontaneity and inventiveness. We wish Chef Percy the best of luck with his CMC test in 2014, but we have a feeling he will pass with flying colors. 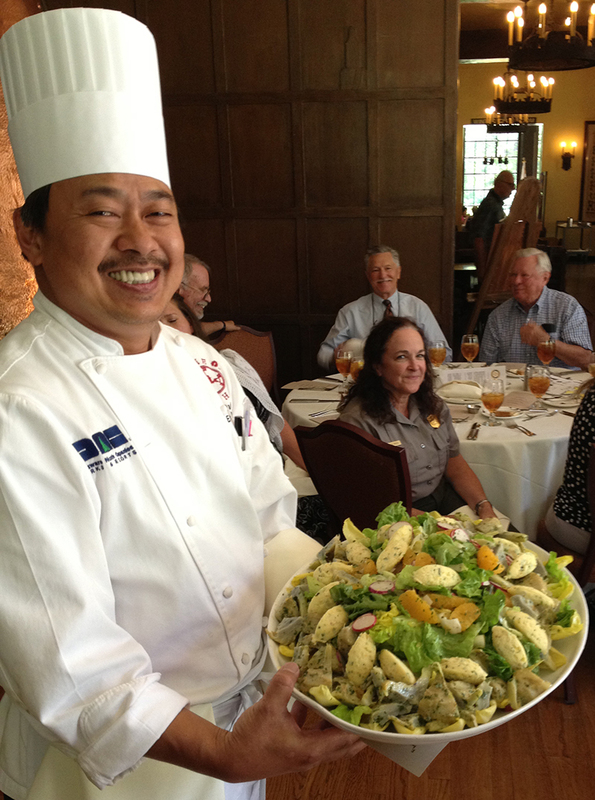 Pastry Chef Paul Padua assists in serving the Rotary Club luncheon at The Ahwahnee. Photo by Teri Marshall. 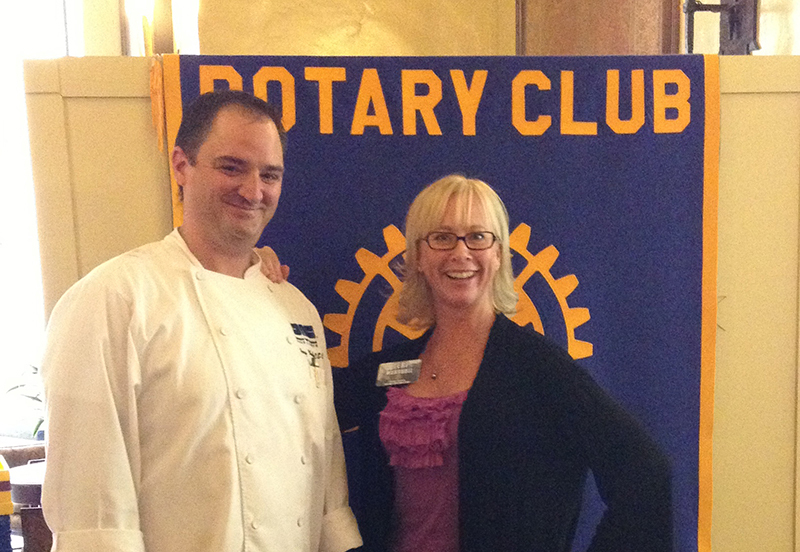 Chef Percy Whatley and Rotary Club member Teri Marshall. Combine the egg yolks, eggs, sugar, lime juice and zest, 2 oz of rum and mint extract into a 2 quart sauce pot, stir with a wire whisk and cook on medium heat. With a rubber spatula, continuously stir and scrape the bottom of the pot until the mixture thickens and coats the spatula. Do not boil, or it will curdle. Remove from heat immediately and transfer to a bowl. Place in an ice bath and stir in butter until melted and well incorporated. Set aside to cool. Whip the cream with the powdered sugar until stiff. Fold whipped cream into lime curd. Combine all of the berries and orange wedges with the chopped mint in a bowl. Drizzle the powdered sugar and rum over and toss vigorously. Cover with plastic wrap and let sit to marinate for five minutes. Layer Macerated fruits and mojito parfait to almost the rim of your favorite summer classy glasses. Decorate with fresh berries, citrus wedges and a sprig of mint. Enjoy! 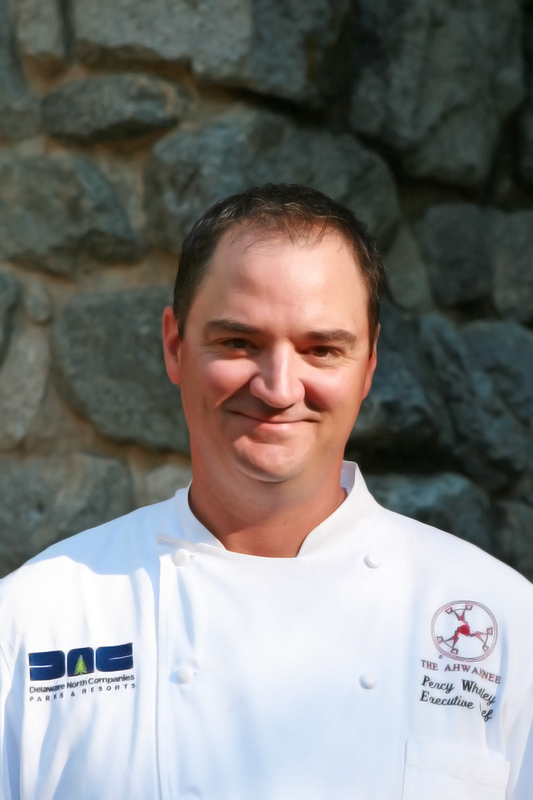 Ahwahnee Dining Room Executive Chef, Percy Whatley is excited to be participating in The Central Coast Wine Classic this year July 11 – 14 at the Avila Beach Golf Resort. Chef Percy, along with other prestigious and well-known chefs, will be involved in preparing the Dinner at Hearst Castle in San Simeon, a six-course meal with paired wines from Vintner Dignitaries. Renowned among true wine insiders, The Central Coast Wine Classic was named one of Wine Spectator’s Top Ten Charity Wine Auctions in America, and features elegant wine seminars, tastings, luncheons and dinners presented by famous vintners and celebrity chefs, as well as distinctive art work from extraordinary California artists. Reserve Tasting Event showcasing the Most Special Wines of 50 California wineries with culinary samplings from fine Central Coast restaurants and live music. 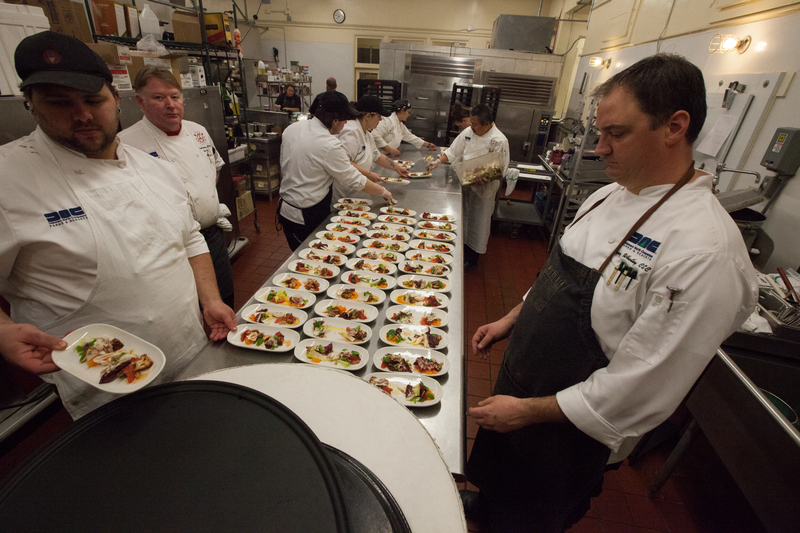 Find out more about the Central Coast Wine Classic, and the other chefs involved in preparing Thursday’s Dinner at Hearst Castle, or make plans to sample Chef Percy’s creations in The Ahwahnee Dining Room. 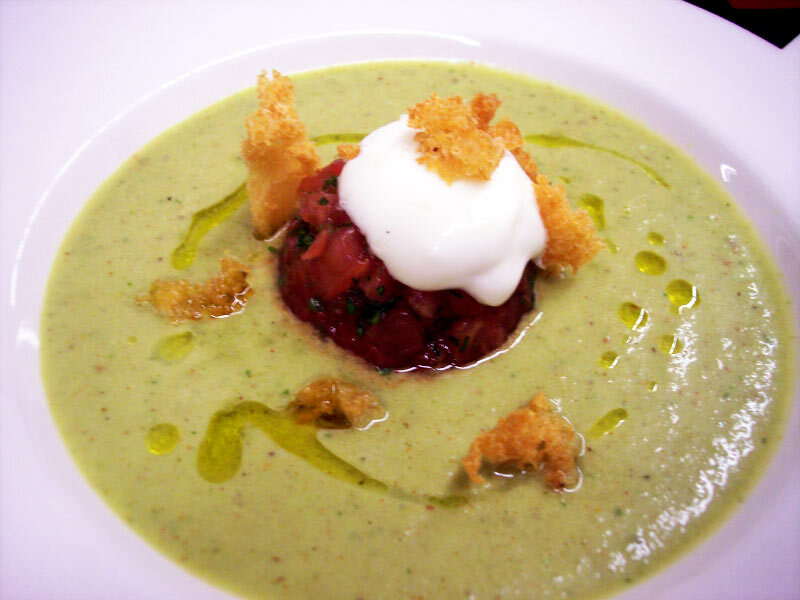 Enjoy a delicious Gazpacho from award-winning Chef Percy Whatley and bring a taste of The Ahwahnee Dining Room home with you. 1. Soak torn bread in milk until soft. 2. Sweat onions, garlic and shallot in olive oil until translucent over medium heat. 3. Toast almonds in oven until golden brown. 4. Toast cumin, celery salt, black pepper and paprika in a dry pan until smoke develops, remove from heat immediately. 5. Combine all ingredients together and blend until smooth, strain through a sieve. 6. Chill and serve with garnish below. 1. Combine tomatoes and parsley. 2. Press into a ramekin or similar mold. Unmold in the middle of the bowl. 3. Pour soup around the molded tomatoes. 4. Spoon a little sour cream or crème fraiche on the tomatoes. 5. Sprinkle with salt, add croutons and drizzle a little olive oil. Serve.